Spring is here and it has me thinking about all the beautiful fresh fruit well be starting to see in the growers market soon. I got so excited I decided to share this yummo fat free Exotic Fruit Dip recipe with you to inspire you to start looking for the fresh fruit in your area. I have mad-love for my Vita-mix blender, so Ill be giving you the directions using that appliance, but you can go ahead and try it in your own blender. Place all ingredients in Vita-Mix container in order listed. Secure 2-part lid. Select VARIABLE speed #1. Turn on machine and quickly increase speed to #4. Run for 15 to 20 seconds or until mixture is smooth and thick. 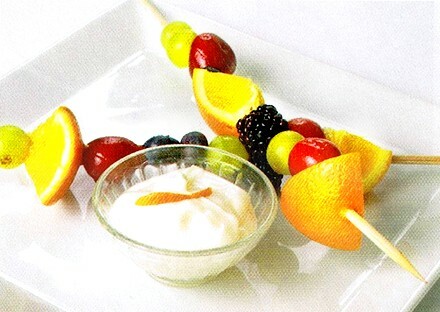 Serve cold with fresh fruit or angel food cake for dipping. Be sure to let me know how you like this one! I LOVE COMMENTS!